Today Crowned Heads announced its fifth annual release for the Tobacconists Association of America (TAA). 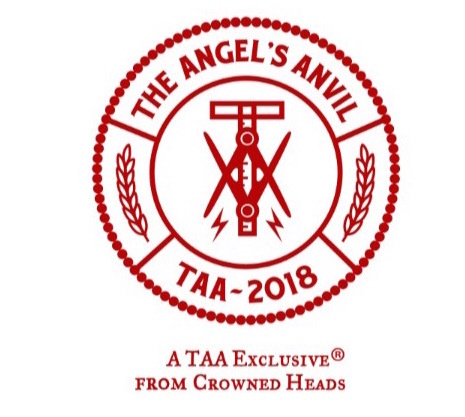 The 2018 release, dubbed The Angel’s Anvil 2018 will make its debut at the TAA’s 50th annual convention scheduled to open April 29 at Casa de Campo in La Romana in the Dominican Republic. As with the previous installments, The Angel’s Anvil 2018 will be made at Ernesto Perez-Carrillo Jr’s Tabacalera La Alianza factory in the Dominican Republic. This year’s blend consists of an Ecuadorian Sumatra wrapper over Nicaraguan binder and filler. The Angel’s Anvil 2018 will be offered in one size – a 5 1/2 x 52 Genios size. “As this is our fifth year producing our TAA Exclusive cigar and we have a lot of ties to the Dominican Republic, we wanted to bring something unique and novel, while paying homage to the Dominican Republic,” commented Crowned Heads co-founder Jon Huber. “This will be our first time utilizing an Ecuadorian (Sumatra) wrapper on The Angel’s Anvil, and the colorway of the packaging was certainly inspired by the colors of the Dominican flag. The Angel’s Anvil 2018 will be presented in 20-count boxes with each cigar carrying a suggested retail price of $11.50. The cigars are expected to ship to TAA retailers in June.